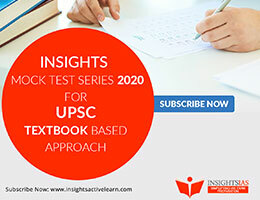 Welcome to Insights IAS Revision Plan for UPSC Civil Services Preliminary Exam – 2019. 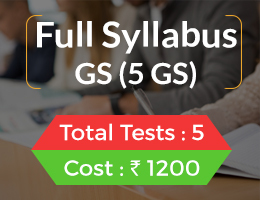 These questions are carefully framed to help you improve various skills and knowledge necessary to face uncertain, unpredictable and difficult questions in real prelims exam. 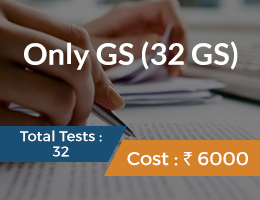 This test is NOT about your scores. It’s about an opportunity to make mistakes and learn from these mistakes now itself. 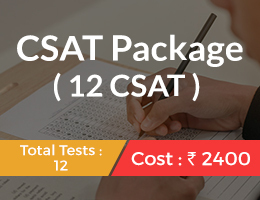 Also, these tests are NOT meant to give you EXPECTED questions for the upcoming prelims. So, don’t judge these questions unless there is an error (factual or typo) in these questions. 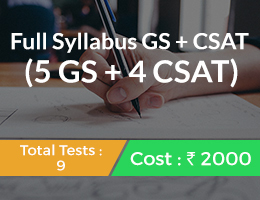 To do really well in these small tests, REVISION is the KEY. Do follow our Revision Timetable religiously. 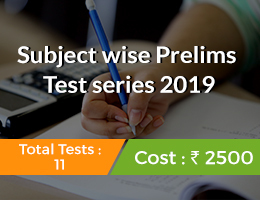 It WILL help you clear Prelims – 2019. 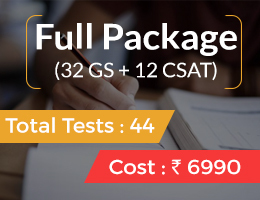 Once you give this test, please POST your scores in the comment box. Also post how you could tackle certain questions – like, based on what logic or skill. This will help people who have trouble eliminating wrong options get a chance to learn from your expertise. Marmagao Port, situated at the entrance of the Zuari estuary, is a natural harbour in Goa. The Kamarajar Port Limited is a corporatized major port and is registered as a public company. Marmagao Port, situated at the entrance of the Zuari estuary, is a natural harbour in Goa. It gained significance after its remodelling in 1961 to handle iron-ore exports to Japan. Construction of Konkan railway has considerably extended the hinterland of this port. Karnataka, Goa, Southern Maharashtra constitute its hinterland. Visakhapatnam Port in Andhra Pradesh is a land-locked harbour, connected to the sea by a channel cut through solid rock and sand. An outer harbour has been developed for handling iron-ore, petroleum and general cargo. Andhra Pradesh and Telangana are the main hinterland for this port. Ennore Port, officially renamed Kamarajar Port Limited, is located on the Coromandel Coast about 24 km north of Chennai Port, Chennai, it is the 12th major port of India, and the first port in India which is a public company. Which of the following is not part of the extensive commercial grain cultivation regions of the world? Extensive Commercial grain cultivation type of agriculture is best developed in Eurasian steppes, the Canadian and American Prairies, the Pampas of Argentina, the Velds of South Africa, the Australian Downs and the Canterbury Plains of New Zealand. Consider the following statements regarding foot loose industries. Foot loose industries can be located in a wide variety of places. These industries are generally nonpolluting industries. Foot loose industries can be located in a wide variety of places. They are not dependent on any specific raw material, weight losing or otherwise. They largely depend on component parts which can be obtained anywhere. They produce in small quantity and also employ a small labour force. These are generally not polluting industries. The important factor in their location is accessibility by road network. Sugarcane industry is gradually shifting from north Indian states to South Indian states Which of the following are the reasons behind it? The production of sugarcane per hectare is higher in Peninsular India. The crushing season in south India is shorter than in north India. The sucrose contents is higher in the tropical variety of sugarcane grown in the southern states. The production of sugarcane per hectare is higher is Peninsular India. In fact, sugarcane crop grows well in the tropical climate of south India. The sucrose content is higher in the tropical variety of sugarcane grown in the south. The crushing season in south India is longer than in north India. In south India most of the mills have modern machinery. Most of the mills in Peninsular India are in cooperative sector, where profit maximization is not the sole objective. Which among the following crop requires high temperature, light rainfall, 210 frost-free days and bright sunshine? 1.It refers to natural gas stored underground in fine grained sedimentary rocks. 2.Hydraulic fracturing process can be used to extract shale gas. Shale gas refers to natural gas that is trapped within shale formations. Shales are fine-grained sedimentary rocks that can be rich sources of petroleum and natural gas. Over the past decade, the combination of horizontal drilling and hydraulic fracturing has allowed access to large volumes of shale gas that were previously uneconomical to produce. 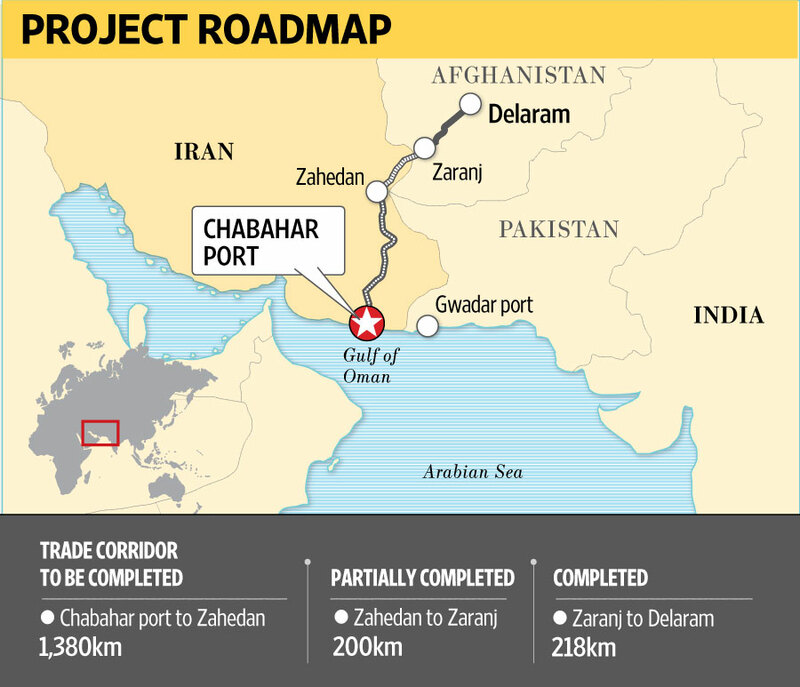 Chabahar Port is locating in which of the following locations? Chabahar Port is a seaport in Chabahar located in southeastern Iran, on the Gulf of Oman. The Bushmen are the indigenous peoples of Kalahari Desert located in Southern Africa covering Botswana, Namibia and South Africa. Which of the above statements given above is/are correct? Gas hydrates are crystalline form of methane and water and exist in shallow sediments of outer continental margins. They are envisaged as a viable major energy resource for future. Gas hydrates with their abundant resource potential is emerging as a potential fuel resource. The preliminary assessment of geological condition and limited available seismic data suggests high possibility of occurrence of large quantity of gas hydrates within the EEZ of India. At present, which of the following continent has the highest rate of population growth? Consider the following statements and identify those which can control birth rate in country. Which of the pairs given above is/are matched correctly? 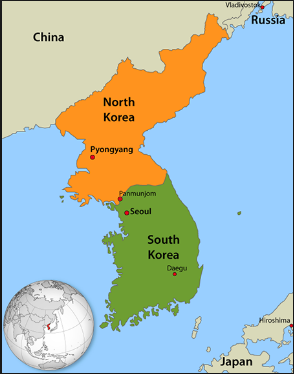 With which of the following countries does North Korea shares border? Which of the pairs given above is correctly matched? Kunar Province is located in Afghanistan, Raqqa city is located in Syria and Caracas is located in venezuela. 1.Assumption and Comoros Islands are located in East Pacific Ocean. 2.8 Degree Channelseparates islands of Minicoy and Maldives. Assumption and Comoros Islands are located in Indian Ocean and Hambantota port is located at extreme south of Sri Lanka. 1.Snakebite Envenomation is on the list of Neglected Tropical Diseases. 2.The Green Skill Development Programme (GSDP) is an initiative for skill development in the environment and forest sector to enable India’s youth to get gainful employment or self-employment. Snakebites Envenomation is on the list of Neglected Tropical Diseases. The Green Skill Development Programme (GSDP) of the Ministry of Environment, Forest and Climate Change (MoEF&CC) is an initiative for skill development in the environment and forest sector to enable India’s youth to get gainful employment and/or self-employment. Half-Earth is a call to protect half the land and half the sea in order to manage sufficient habitat to ensure the long-term health of our planet. The Half-Earth Project is bringing this conservation moonshot to life. 1.Sacred groves in India enjoys exclusive protection under Wildlife Protection Act, 1972. 2.Himachal Pradesh leads in state-wise distribution of sacred groves. 3.Ken-Betwa river interlinking project pose threat to Pench Tiger Reserve. Sacred groves are not exclusively protected under Wildlife Protection Act, 1972. Himachal Pradesh leads in state-wise distribution of sacred groves. Ken-Betwa river interlinking project pose threat to Panna Tiger Reserve. 1.The ‘Composite Water Management Index’ report is prepared by NITI Aayog. (IEP). The IEP is the world’s leading think tank that develops metrics to analyse peace and quantify its economic value. possible to study the fundamental building blocks of matter in more detail than ever before. 1.Scheduled Banks in India constitute those banks which have been included in the second schedule of Reserve Bank of India (RBI) Act, 1934. 3.Scheduled banks automatically acquire the membership of clearing house. Scheduled Banks in India constitute those banks which have been included in the Second Schedule of Reserve Bank of India (RBI) Act, 1934. RBI in turn includes only those banks in this schedule which satisfy the criteria laid down vide section 42 (6) (a) of the Act. The banks included in this schedule list should fulfil two conditions. 1. The paid capital and collected funds of bank should not be less than Rs. 5 lacs. 2. Any activity of the bank will not adversely affect the interests of depositors. Every Scheduled bank enjoys the following facilities. 2. Such bank automatically acquires the membership of clearing house. The scheduled banks comprise scheduled commercial banks and scheduled cooperative banks. 1.Neelakurinji is ashrub that is found in Eastern Himalayas. 2.Neelakurinji’s blue flowers blossoms for every twelve 12 years. Neelakurinji (Strobilanthes kunthianus) is a shrub that is found in the shola forests of the Western Ghats in South India. Nilgiri Hills, which literally means the blue mountains, got their name from the purplish-blue flowers of Neelakurinji that blossoms only once in 12 years. Some Kurinji flowers bloom once every seven years, and then die. Their seeds subsequently sprout and continue the cycle of life and death. Toda Tribe is the most ancient and unusual tribe of Nilgiri Hills of Tamil nadu. The todas have their own language. They have their own secretive customs and regulations. Todas worship nature like hill gods, Lord Amodr (the realm of the dead) & Goddess Teikirzi. Toda community is well known for its embroidery garments. 2.Project Tiger and Project Elephant are integral part of Integrated Development of Wildlife Habitats. 3.Tigers are naturally found in all South Asian Countries. Integrated Development of Wildlife Habitats is a centrally sponsored scheme consists of Project Tiger (CSS-PT), Development of Wildlife Habitats (CSS-DWH) and Project Elephant (CSS-PE). Support to Protected Areas (National Parks, Wildlife Sanctuaries, Conservation Reserves and Community Reserves). • Protection of Wildlife outside Protected Areas. • Recovery programmes for saving critically endangered species and habitats. Which of the following state is the original habitat of Bru Tribes? Reang or Bru are one of the 21 scheduled tribes of the Indian state of Tripura. The Bru can be found all over the Tripura state in India. However, they may also be found in Mizoram, Assam, Manipur. They speak the Reang dialect of Bru language which is of Tibeto-Burmese origin and is locally referred to as Kau Bru.